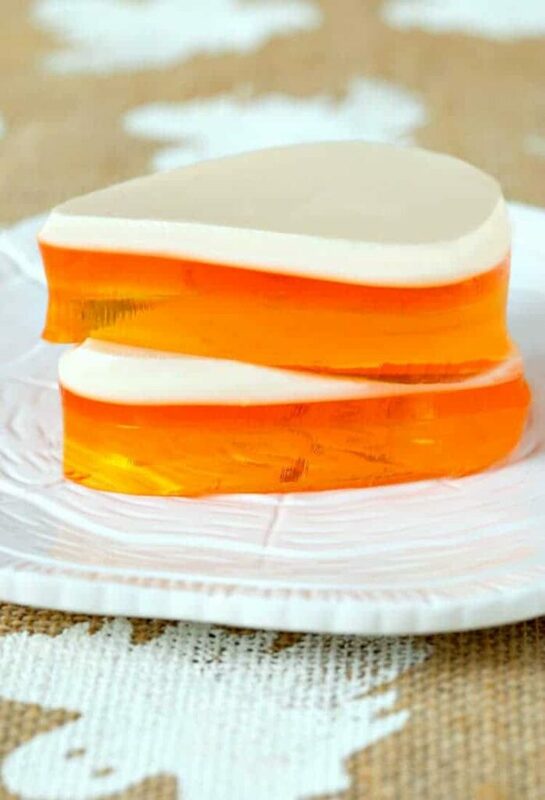 Make this RumChata Candy Corn Jello at your Halloween party! A fun and festive jello shot recipe for all your parties, not just Halloween! I have to tell you…this is the jello shot recipe you’ve been looking for. This is the fun, boozy jello shot recipe that you HAVE to make for Halloween. Or switch the colors up and make them for Christmas. Or New Years or Valentine’s Day. Whenever, because let me tell you, they are AMAZING. 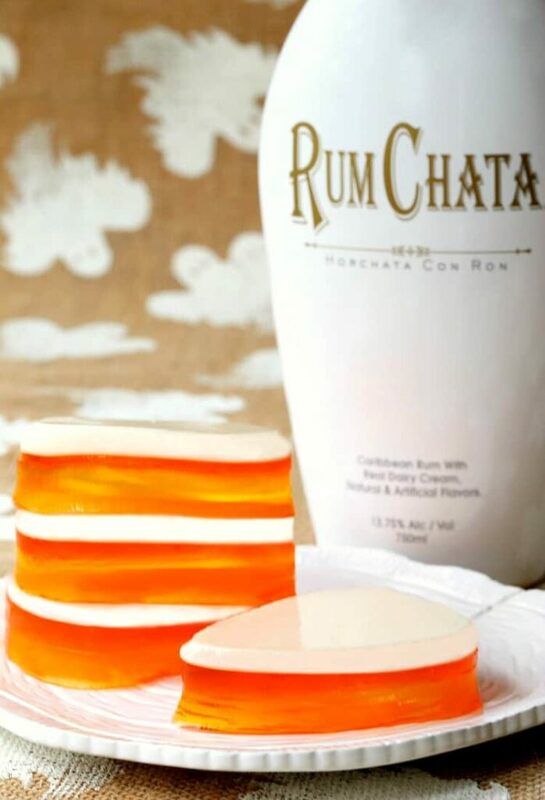 All you need to do is make a white layer with RumChata and the rest is up to you. I know you’ve all had jello shots, obviously. 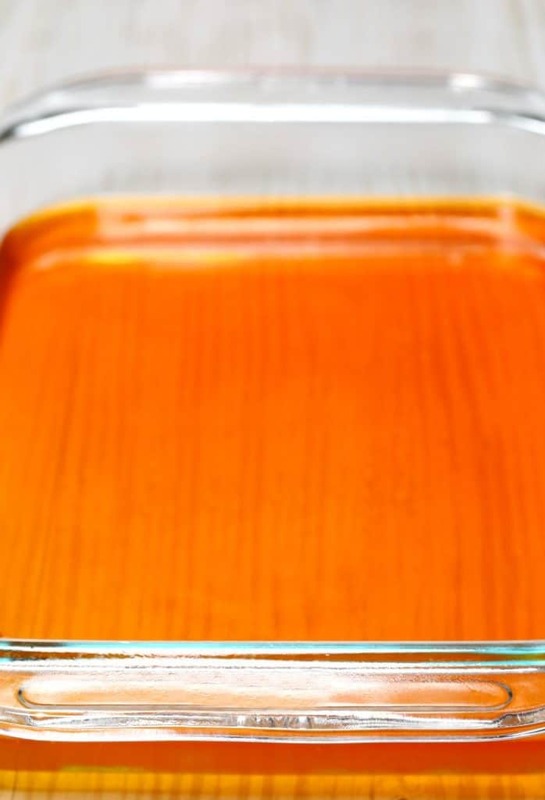 But this candy corn jello shot recipe isn’t just boozy, it’s also super tasty! The flavor and color of RumChata worked out perfect for the top white layer of these candy corn shots. In fact, the whole top layer is pretty much solidified RumChata. I wasn’t sure if it was going to work but I really, really hoped that would. I started out with lemon flavored jello for the bottom, yellow layer. Now you can go extra boozy and flavor each color of jello but I didn’t want to take away from the RumChata flavor so I left those alone. But for instance, you could add plain vodka or rum to this layer. The middle layer is the orange layer – and also orange flavored…you could add Cointreau or Triple Sec. The third layer is the RumChata layer. The most important layer of all. What you do is grab clear gelatin and substitute RumChata for most of the water. I threw a half a cup of water in there for good measure, but the rest is Rumcahta as you can see from the color. So now we have our three candy corn colors, all layered up and chilled. Time to slice and serve. I grabbed candy corn shaped cutters from Amazon, but you can use whatever cutter shape you want to or even just use a knife and cut them into squares. 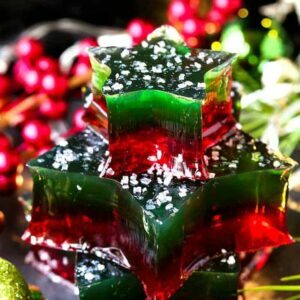 The most important part about this jello shot recipe is the taste – and this recipe is out of this world delicious. • You can use different cookie cutter shapes for each holiday, or make them in plastic shot glasses! Just remember to keep these boozy treats off of the kids table! 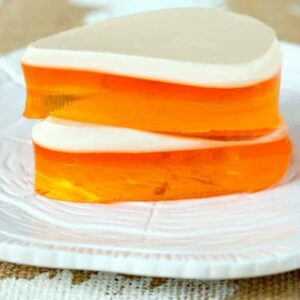 An easy jello shots recipes with Halloween flair! A perfect treat for adults at your next Halloween party. Make the yellow layer first by adding 1 1/2 cups boiling water to 2 packages of Jell-O. 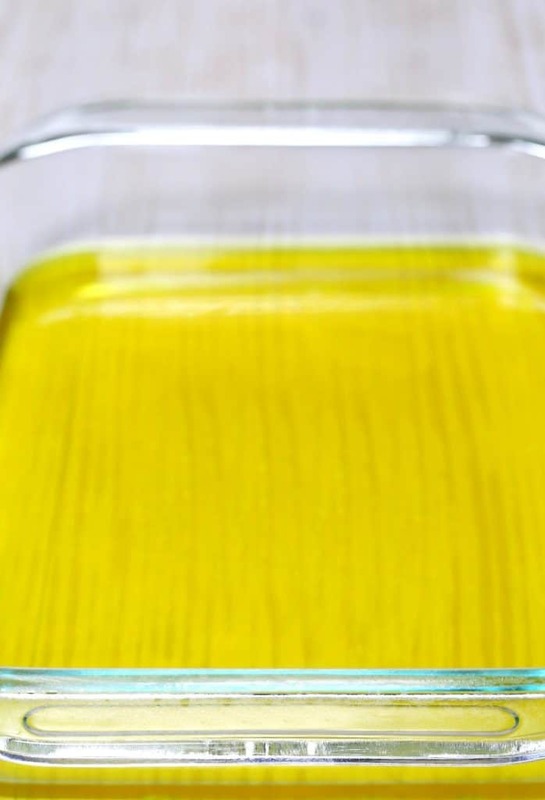 Stir until dissolved then pour into a 9″ x13″ rectangle baking dish. Chill for 2 hours until set, then repeat with the orange layer, pouring on top of the yellow layer. Refrigerate for 2 hours longer. 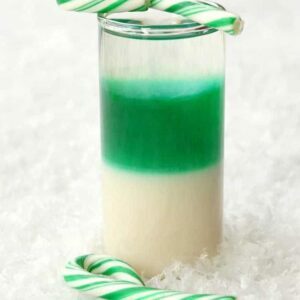 Sprinkle the plain gelatin over a half cup of RumChata and let sit for 5 minutes. Heat the other cup of RumChata in the microwave for 5 minutes, just until warm. 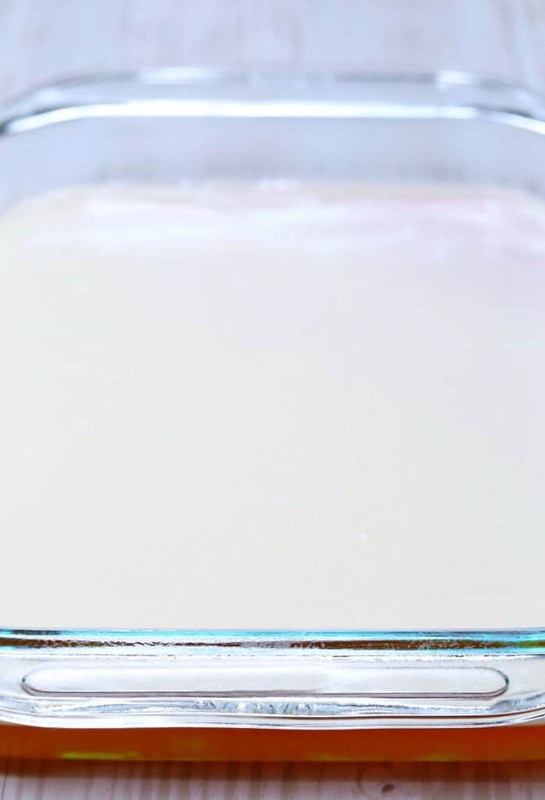 Stir the gelatin into the cold RumChata then pour into the bowl with the warmed RumChata. Stir until combined and then pour over the orange layer of Jell-O. Chill for another 2 hours or until completely set. Cut into squares or desired shape. 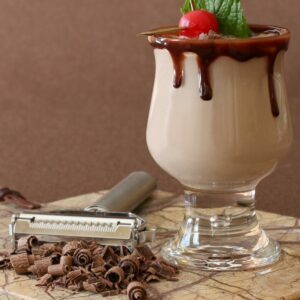 *This is a sponsored post by RumChata, all opinions and recipes here are mine!